Some residents in the area fear that contamination could eventually extend beyond the base, which closed in 2011. The Navy plans to expand its search on the former Brunswick Naval Air Station property for potential contamination from chemical compounds that have caused health alarms near military bases in New Hampshire and other states. On Thursday, the board charged with overseeing environmental cleanup at the former Navy air station will discuss the results of tests on the base and in nearby private wells for the presence of perfluorinated compounds, or PFCs. Restoration Advisory Board members also are slated to discuss a Navy proposal to conduct additional rounds of basewide testing for PFCs. Once a common component of firefighting foams as well as chemicals used in household products, PFCs now are listed as an “emerging contaminant” by the U.S. Environmental Protection Agency. 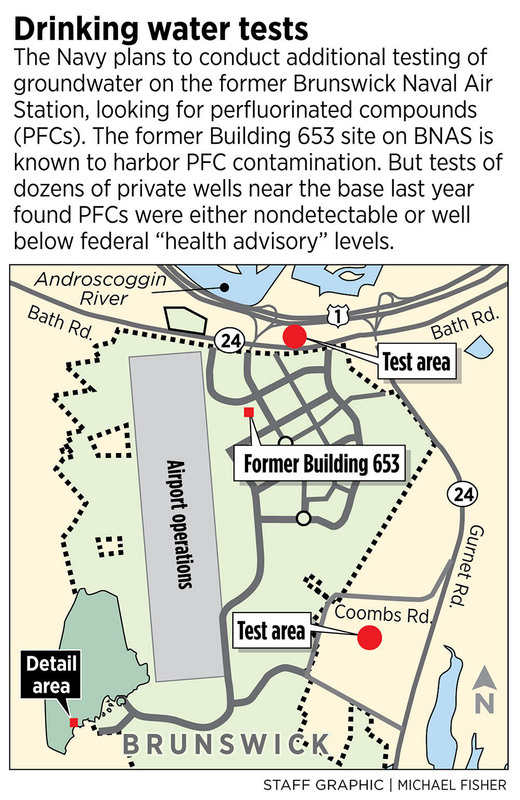 The class of chemicals has made headlines in places such as Portsmouth, New Hampshire, where adults and children living near the former Pease Air Force Base were found to have substantially elevated PFC levels in their blood. The PFC contamination in Brunswick is believed to be less of a cause for concern. Recent testing of more than 30 private wells just outside of the base detected PFCs in some samples, but at low levels far short of the EPA’s “health advisory” threshold. “I think the results were encouraging and quite positive,” said Chris Evans, an environmental hydrogeologist with the Maine Department of Environmental Protection, which worked closely with the Navy to determine whether PFCs were seeping into groundwater supplies outside the former base. Yet the Navy knows of contamination above EPA’s advisory levels in several areas of the base, including a fire training location and a former storage facility, known as Building 653, for fire suppressant foam. And the long-term concern among some local residents is that PFC contamination could eventually migrate via underground water supplies to areas outside the base. A contractor working for the Navy recently completed additional sampling and testing around the Building 653 site, off Bath Road/Route 24. Navy officials declined to release details of the test results last week, but are expected to provide an overview during Thursday’s meeting. Perfluorinated compounds are a class of chemicals – sometimes referred to by other acronyms such as PFOS, PFOA or PFAS – that were used for decades in a wide range of products because of their ability to repel water and grease. In addition to airport firefighting foam, PFCs helped make Teflon cookware non-stick, made treated carpet more stain-resistant and coated the insides of microwave popcorn bags or fast-food wrappers. But those same qualities mean PFCs linger longer in the environment and in the human body before breaking down. PFCs were used so widely that they can be found in the environment, in humans and in animals all around the globe. While research is ongoing into potential health impacts from exposure to PFCs, studies of lab animals have shown the compounds can affect reproduction, development, liver and kidney function and can cause tumors, according to the EPA. 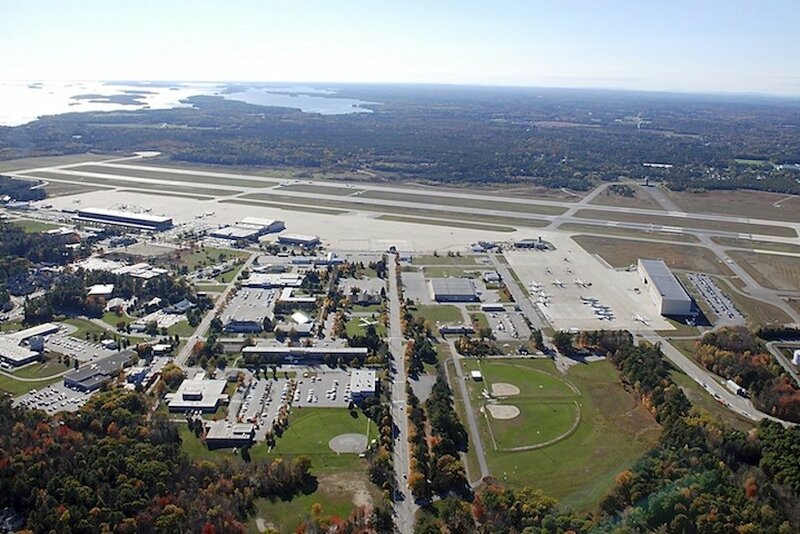 The Brunswick base closed in 2011 as part of the last Base Realignment and Closure, or BRAC, process aimed at shuttering under-utilized military installations. The Midcoast Regional Redevelopment Authority now operates the 3,200-acre property as the Brunswick Landing business campus, although the Navy continues environmental cleanup and monitoring at several contamination sites. Suzanne Johnson, a Brunswick attorney who co-chairs the Restoration Advisory Board, was pleased that the Navy planned another round of base-wide testing for PFCs. “I think they are finding hotspots all over the place without a clear sense of what is producing them,” said Johnson, who also serves on the Brunswick Area Citizens for a Safe Environment, a committee that has pushed for more aggressive monitoring and cleanup on the base. Roughly 100 businesses or other entities now operate out of Brunswick Landing. All of those tenants, with the exception of Mere Creek Golf Course, are connected to the town’s public water system. While deed restrictions currently prohibit tenants from putting in wells, Brunswick Area Citizens for a Safe Environment members have argued those deeds could be modified. Instead, the group has been calling for a zoning change containing a blanket prohibition on groundwater extraction at Brunswick Landing. “The issue for the base is what are you going to do with the groundwater over the long-term because any time you add groundwater or extract groundwater, you’re going to be changing the (hydrologic) system,” Johnson said. Johnson also said the organization is concerned PFC contamination in Picnic Pond – an area the Navy plans to sample again this year – could be affecting nearby clam flats in the Androscoggin River. Those flats are currently closed to harvesting because of other contamination but they have yet to be tested for PFCs, she said. Recent tests suggest that the known underground plumes of PFC contamination are not migrating into nearby private wells, at least not at levels that would presently cause concern. The Navy and the Maine Department of Environmental Protection tested 29 private wells in a neighborhood between the former base’s southeastern edge and Route 24. According to a draft report provided to the Portland Press Herald by the Navy, one type of PFC was detected in 19 of the 29 wells sampled while another type was detected in eight of the wells. All of the levels were below – and in all but one case well below – the EPA’s “health advisory” level of 0.07 microgram per liter. Additionally, samples collected from four wells in a strip of land downstream from Building 653 had no detectable PFCs or levels below the EPA health advisory. PFC levels in several surface water sites, however, came back higher than the EPA’s health standard. But even the highest levels “do not pose a human health risk/hazard above target levels,” according to the draft report. “Evaluation of the data collected as part of the off-base investigations concludes that (PFCs and other chemicals) are all below applicable criteria and no properties require the need for an alternate water supply,” the report concludes. The Restoration Advisory Board meeting, which is open to the public, will be held Thursday from 4:30-6 p.m. at the Best Western Plus, 71 Gurnet Road in Brunswick.